Famous Russian poet Alexander Pushkin often visited his estate in the village Mikhailovskoe in Pskov region. Today the village becomes a museum, where tourists can walk around the old manor, try on the costumes of the 19th century and visit the places where the great Russian poet lived and worked. The Russian national poet Alexander Sergeyevich Pushkin (1799-1837) was born in Moscow, but considered his spiritual home to be his estate Mikhailovskoe in the Pskov region of northwest Russia. Today, Mikhailovskoe lies under the administrative authority of the small town of Pushkinskie Gory, 120 kilometres southeast of the provincial capital Pskov. Tourists can not only visit the picturesque homesteads of the founder of modern Russian literature, but also the neighboring estates of Trigorskoe and Petrovskoe, as well as the Bugrovo village museum. “Breakfast is served from 10 a.m. to 12 p.m.,” says one employee of the guest house “V Bugrovo,” which lies on the grounds of the Bugrovo village museum. “Why serve breakfast here so late?” asks a puzzled guest shortly after arriving. The provincial capital Pskov lies 291 kilometers southwest of St. Petersburg and 732 kilometers from Moscow. From St. Petersburg you can reach the city in a few hours by car. Busses and trains also run regularly. The easiest way to reach Pskov from Moscow is by night train, which departs the Leningrad train station daily at 6:30 p.m. and completes its 13 hour journey at 7:30 the next morning. Once in Pskov, Pushkinskie Gory can be reached in 2 hours by bus or taxi. Taxis cost 50 euros ($66), while going by bus costs only 5 ($7). “Well, there is no need to get up early here… the fatigued city dwellers want to sleep in at a country inn. That’s the point of your trip!” says the lady resolutely. The desire to sleep in and enjoy the quiet and nature is a typical reason bringing visitors to Bugrovo today, but not the only one. 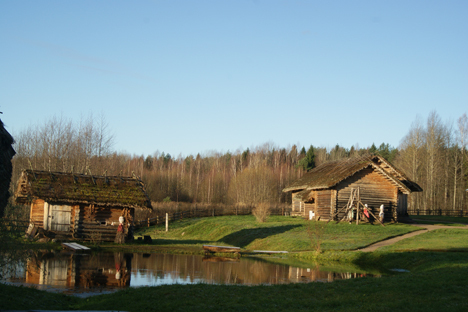 For some decades the village has been an open-air museum and a part of the Alexander Pushkin museum. The small village borders Pushkin’s Mikhailovskoe estate. And until serfdom was abolished in 1861, the local peasants were the serfs of the family. The noble poet sought contact with the simple folk and often visited Bugrovo. He was interested in folklore, collected fairytales, songs and sagas, and also concerned himself with the well-being of the locals. Pushkin did not see himself as a revolutionary, but rather as a friend of the people. In his letters and private notes, he always stressed that the government and nobles should be aware of their responsibility for the bonded peasants. He was saddened and infuriated when he learned of the conditions that the serfs had to endure. With great concern he wrote in his notebook after visiting Bugrovo that the peasants did not have enough wood to heat their ovens and could not afford glass windows for their huts. “For us it was never a question that the Alexander Pushkin Museum would contain an open-air installation,” reports the scientific assistant, Mariya Timofeeva. “Tourists can visit peasant dwellings and farm installations – threshing floors, barns, cow stalls, whose external and internal design is based on those of the first half of the 19th century. This helps to convey the impressions that Alexander Sergeyevich Pushkin collected when he came in contact with his serfs”. There are several hotels and guest houses in Pushkinskie Gory that are located in close proximity to the Alexander Pushkin Museum are available for tourists and range from 30 to 150 euros ($39-197) for a night’s stay and breakfast. Lodging with locals is available starting at 25 euros ($33). But the visit is also very hands-on. You can slip into the role of a peasant in the 19th century. Visitors can thresh corn with an old flail – something that is beloved by both young and old. Spinning wheels and looms still work and can be used by curious guests with the help of knowledgeable assistants. Excellent food and drink can also be found in Bugrovo. The guest house “V Bugrovo” neighbors a proper tavern, “Traktir.” Traditional Russian ovens are used to cook, bake and sauté the specialties. The ovens are heated using wood and help create a plethora of dishes. Some of the favorites include Borscht, a traditional red beet soup, Shchi, a cabbage soup, Solyanka, a meat stew, Draniki, potato pancakes, Russian pancakes called Blini and fried quark pancakes called Syrniki. The holiday resort “Arina R,” which is also located in Bugrovo, spoils Russian and international guests with typical specialties. The heart of the Alexander Pushkin museum is the Mikhailovskoe estate. The estate has been in the Pushkin family since 1742. The poet visited his estate often and was in exile here from 1824 – 1826 as he was forced to leave St. Petersburg after falling out of favor for making critical remarks about the government and the church. Pushkin was forbidden to leave the Pskov region during this time and was under constant police surveillance. He found his living conditions to be very humiliating and degrading. Nevertheless, the author tried to make the best of the situation and used the time in Michailovskoe to work and explore the region. “Today, Michailovskoe not only houses a museum, but is also a national monument for many Russian men and women,” says museum assistant, Olga Uryadnikova. After visiting Mikhailovskoe, getting to know the neighboring Trigorskoe and Petrovskoe manors, which are also a part of the Alexander Puskin museum, is also more than worth it. While the poet was in exile in the Pskov region, he visited Trigorskoe almost daily as his best friend Alexei Wulf (1805-1881) lived there. The Petrovskoe estate belonged to Pushkin’s maternal relatives, the Hannibal family. The poet was also a regular visitor here. His great grandfather, Abraham Petrovitch Hannibal (1696-1781) was the son of a local African count and the godchild and companion of Czar Peter the Great. Pushkin was proud of the achievements of his ancestors and felt a deep spiritual connection to them.